I’ve read other people’s blogs who are athletes and pregnant (or were pregnant, sometimes I go back and re-read their blogs while they were pregnant since now it’s more interesting and relevant to me) and there’s such a wealth of information out there. I feel like I’ve sort of glossed over a lot because I guess I assume people just aren’t that interested. This has always been more of a triathlon blog, and I’ve never had a ton of commenters but when I do it’s always race related or something of that sort. Now my blogs don’t get many comments at all which I can only assume means that the general reader frankly just doesn’t care. Which is totally okay! I don’t expect people to care about the almost 7 months I’ve been carrying around this life-sucking force within my body. But anyways, I decided to make some of my own observations about pregnancy thus far. Heidi and I have been swimming in the same lane together pretty much ever since we started the Master’s program here. We’ve both gotten faster since the beginning, but our trajectories have been along the same path. Unless there was a specific reason or we had a new person show up in our lane, I would almost always lead (Parrish used to be the other piece to our “not former collegiate swimmers but better than most triathlete swimmers lane triumvirate”, but he has disappeared. Under the covers apparently. He has been showing up only on our holiday practices that start later). Anyways, I still swim in Heidi’s lane, but so much slower. Yesterday, we were doing 400’s pull. And she lapped me before I got to 300 yards. So the next round I made it my goal to not get lapped before she finished. It about killed me, but I touched the wall at 350 yards before she touched for her 400. Then the next one I was stick a fork in me done and I think she caught me at 200 yards. Also, let’s talk about weight. 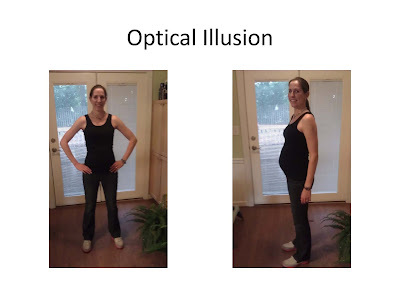 A local triathlete said to me a few months ago at a race, “Oh, my wife only put on 14lbs when she was pregnant.” Okay clueless men – file this under “Things You NEVER EVER say to a pregnant women.” First off, what the heck am I supposed to say to this? Uh, good for her and by the way that is not very healthy? I’m at 30 weeks and have put on that much weight. And no I’m not eating for two. I sort of think that’s BS. I’m eating pretty much what I normally did pre-pregnancy, just with less intense exercise. I may be eating a few more desserts, but anyone who knows me knows I have a gargantuan sweet tooth. It’s hereditary and totally not my fault. Anyways, when you’re pregnant, your body is preparing itself to sustain this entire other life and it needs this extra weight and will hang onto it as necessary. So go ahead and take those 14lbs and $%(*^*($)@$(**%(@! I’m still quasi running/jogging/walking. I’m a shuffler for sure and I don’t go very fast but I still love being out there and will continue to be out there even if it means I need to walk more than jog. The weather is absolutely gorgeous right now and there’s no way I’m not going outside to enjoy it. Pretty much it seems that if I go for a run, I can count on some hip/pelvic discomfort afterwards, so I don’t run two days in a row anymore. On Sunday I felt awesome and made it to the bathroom (oh how landmarks change when you’re pregnant) faster than I have in a long time, without any heartrate walk breaks! Then on the way back though even though I still felt great my HR was skyrocketing up the hills. I ignored it for awhile until I saw a number that I thought was way past the line and power walked for a bit. Monday at our group run I just went for a walk while the others ran from station to station. At least the stations slowed them down so I could chat with people. In a few weeks I’m having my baby shower which I’m looking forward to. We still need a lot of stuff for the little guy so hopefully most of it gets taken care of at the shower. Both my sisters and my mom will be in town for it, prompting me to tell Marty he may want to find different accommodations. Anyone want to put up a cute guy for a few days in a couple of weeks? He is funny and smart, does not snore (much) and doesn’t talk in the mornings until at least 1 cup of coffee has been thrown down his gullet. Other things: Now that fall is upon us (fingers crossed, anyways) I have approximately 5 work shirts and 4 pairs of pants that need to get me through the rest of this pregnancy. I hope people start giving me a little leeway (yes, it’s Tuesday, that means its green sweater day!) Luckily, I still fit into most running shorts and tights. I’ve been able to use Marty’s shirts which tend to be longer, but even those are running low. I have not been on my bike in weeks. Completely due to my own lack of motivation - riding outside isn't happening anymore because too much risk of falling because of being imbalanced and the trainer is plain boring. Honestly, out of the 3 sports in triathlon, in order of love for me they go: running (by a long shot), then swimming, then biking. I definitely have to have a race goal to keep me on the bike. I think I gained 14 lbs by the time I was 9 WEEKS pregnant, never mind 9 months (mostly due to extreme non-stop nausea that was only relieved by eating). You look great! You look absolutely fantastic for 7 months pregnant! So tiny still! Same with Rebecca on the weight gain...I think I gained somewhere around 35 total in the end, and you know what, I lost it all in probably 2-3 months. It doesn't matter. You look absolutely wonderful though! As for flip turns, I found, that the only way I could still do them was if I starting the flip pretty far away from the wall and did a very big open flip with my legs spread apart instead of being so crunched up. But even then I think in that last month, I gave those up too. I think I've already gained 14 pounds. I am one of those "lucky" pregnant women who just get big everywhere. You look fabulous. Swimming is starting to sound appealing to me again but I'm with you, no need for me to get on the bike if I'm not training for a race. I like all your updates. No way am I telling how much I gained when I was pregnant with all 11 lbs of you! our bodies do what they will do regardless of what WE do to try and stop it. Men have no clue, honestly no clue about how much we really gain and the changes we really have. I gained 40, 40 and 35 with each one despite great exercise, eating healthy and not over eating...it is what it is Bri. And flip turns were my enemy while pregnant...I would get dizzy too. I totally agree wit everyone that you look amazing, I'm so jealous actually. But the greatest part is how quickly you'll recover afterward because of what you're doing now. Umm,yeah, the 14 lbs guy. Dumb-@$$. I gained around 40 lbs total, so on the high end, but everyone kept saying I was "all belly." Errrmmmm...not exactly, but thanks. It sounds like the pregnancy is going really well. You might want to look into one of those belly supports to use while running. One of those extended my running another month and a half than I would have been able to do otherwise. I'm assuming that the anonymous comment is from your Mom. THAT right there is classic awesomeness. My mother told me early on, "I was sick as a dog with you." To which I responded, "I'm not sick at all," followed by (within 48 hours) the onset of a month long spate of nausea. People don't really comment on my blog either unless it's a race report, or my mother commenting on a toddler report. I figure that's because there are lots of more entertaining alternatives these days and I don't post often enough to keep an audience. I did send someone to your blog that is due maybe a month after you who contacted me with questions about racing & training during pregnancy. You're beautiful and doing a fantastic job keeping a balance between staying fit and healthy weight gain. I gained 48 lbs both times, lost it in 3 or 4 months after Marty, and 3 weeks after Anna. You'll be back in top form sooner than you think.